Also available for Android, Windows, Mac OS, Linux, Steam, iOS, Kindle Fire, Chrome and Facebook. 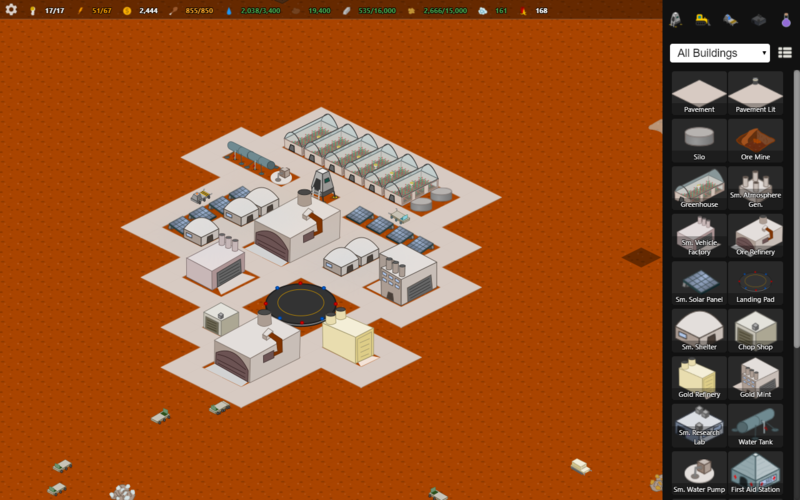 My Colony is a space colonization and city building simulation game. Start with a small landing craft on a barren and desolate world, and build it up into a thriving space empire! 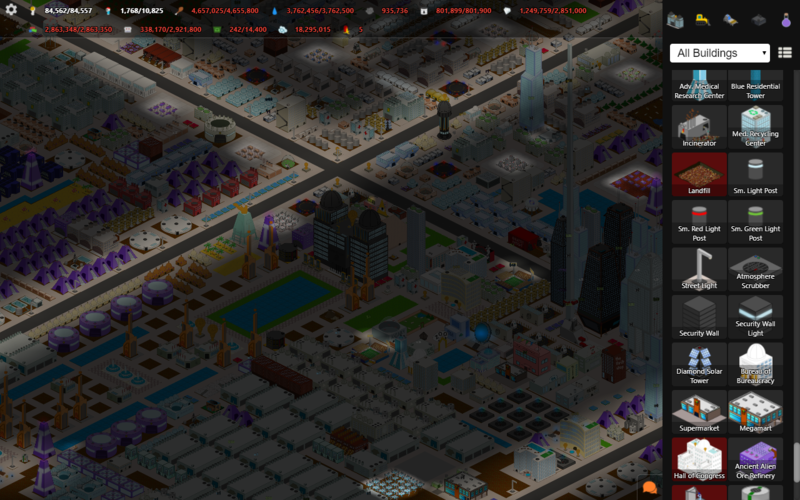 My Colony is all about building your city and managing all of it's various aspects, from resources, employment, education, housing, happiness, and more. You can start on a relatively simple earth-like planet, or choose from some of the more brutal and inhospitable worlds for an added challenge. There are also four unique civilizations to choose from, each with their own tech and building trees. My Colony can be played in either online or offline mode. Online mode requires an Ape Apps account, and allows you to found your colony under the government of another player, who will help take care of you and send you resources and aid in the early game. Once you grow and your civilization becomes self-sufficient, you may declare independence and even take new child colonies under your own wing as the leader of a commonwealth of planets. In offline mode, there is still limited multiplayer over a local area network. You may exchange resources and send messages between other players on the same LAN. In My Colony, you can create either a single city game, or create a new region, which is a collection of smaller colonies working together in tandem, sharing a similar resource and technology pool. Each play mode offers a unique style and different challenges. Finally, My Colony also includes both a map and texture editor, so that you may mod and customize the game as you see fit. You can even export your game modifications and share them with others! 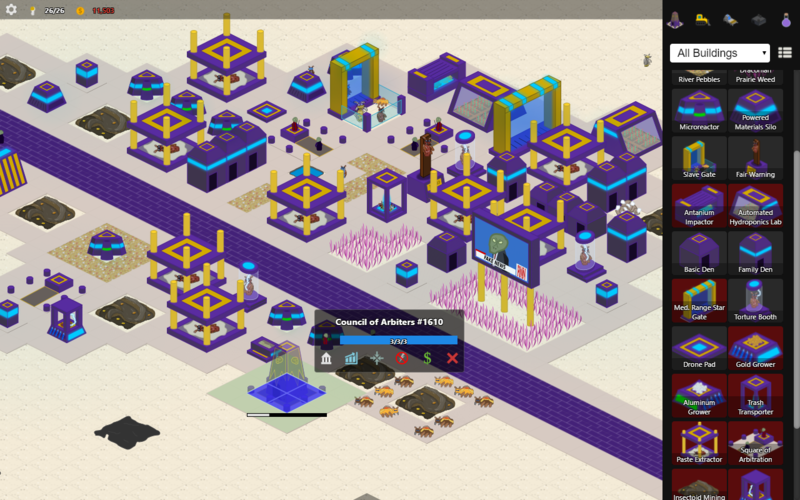 My Colony is a large game and is under constant development, with new content being added on a regular basis. Check it out, and leave feedback on things you would like to see added or changed! Most of the new content in the game is the direct result of community feedback, so your ideas matter! Thanks for trying My Colony! My Colony is completely free, but it is supported by in-app advertising. Premium upgrade options are available on all major platforms, but if you purchase a license key directly from Ape Apps, you will recieve a license key file which unlocks the upgraded version of My Colony on all platforms! Click Here for more info. Sat, 20 Apr 2019 14:13:59 I am just putting the finishing touches on the My Colony v0.85.0 patch, which should be going out to all platforms over the weekend. v0.85.0 is the "dark update" and you are about to find out why! Let's take a look. Wed, 03 Apr 2019 20:38:21 I am currently putting the finishing touches on My Colony v0.84.0, which should be shipping out to all platforms over the next few days. Here is what to expect! Wed, 06 Mar 2019 16:27:19 Once again it is My Colony update time, and v0.83.0 will be heading out to all platforms within the coming days. This release continues the bug bashing series I have been working on, but also implements a few new features that I hope you find useful. Let's take a look!